Saving energy in homes, businesses and public buildings through intelligent use of air conditioning and heating makes economical and environmental sense in every respect. Providing the means to reduce energy consumption in this area helps reduce carbon output, pollution and environmental damage while saving real money for families, companies and local authorities. Welcome to our website. At AirConergy, we endorse an intelligent energy saving product known as the HVAC Smart Chip which when connected to an AC or heating system can increase its efficiency by around 10-15% (14.8% on average). It is well known that large power plants are responsible for the generation of the electricity that everybody uses in homes, public edifices and business premises. The down side to this set up is that power plants also produce around 41% of the main greenhouse gasses in the US, such as carbon dioxide. The good news is that, according to a study undertaken by Pacific Gas and Electric, if the majority of air conditioning (AC) systems located in California alone raised their energy efficiency levels by as little as 5%, the whole state could save the equivalent amount of energy produced by four 300-megawatt producing power plants. Four such coal-fired plants emit 2,500,000 lbs of carbon dioxide every hour! Making a conservative estimate, it can be seen that the HVAC Smart Chip when applied to most AC systems in the state could prevent 5 to 7.5 million lbs of carbon dioxide from entering the atmosphere every hour. This is a huge saving and substantial reduction in greenhouse gas emission. This estimate is only for the state of California. Just imagine extending that concept to the whole country. The greenhouse gas emission reduction would be staggering if just half of all HVAC systems in the country were to fit the Smart Chip and reduce their energy consumption! Imagine the saving in monetary terms. It would run into millions of dollars every year. You can find out more about this easy-to-install device right here! 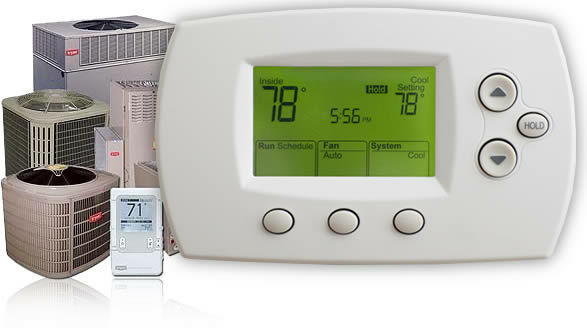 The bottom line for having a good heating and cooling system installed in your home or business is this: To maintain a comfortable living or working climate and an amenable temperature that's not too cool and not too warm all year round. Gaining a fuller understanding of how these systems work can help make a better place for you to live in. That's because you'll know how to set the thermostat intuitively to get the best level of comfort balanced against the most economical (fuel saving) operation. This is to everyone's benefit! In the pages published on this website, we share our knowledge and experience to help you enjoy a comfortable way of life that need not cost quite as much in electricity costs through intelligent energy usage. Now from where I'm sitting, that sounds like a pretty attractive deal! Does a Ventless Portable Air Conditioner Exist?